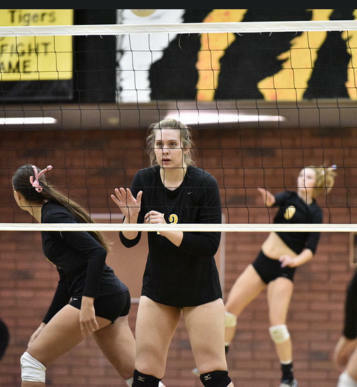 Gilbert overcomes 2-0 deficit to beat Perry - The third-seeded Gilbert Tigers have been looking for the right formula to make a deeper run in the Division I state volleyball tournament. 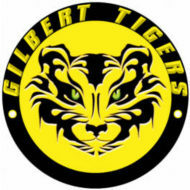 After winning the big school title in 2011, Gilbert has not reached the semifinals the last three years in a row. After two sets on Thursday, the pattern looked to continue. 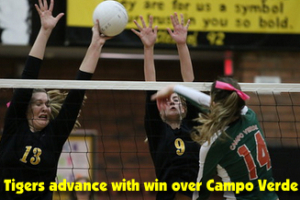 Despite coming up short early, the Tigers rallied for a 24-26, 23-25, 25-18, 25-19, 15-11 win over No. 6 Perry to advance to Saturday’s semifinals at Mesquite. Gilbert will face No. 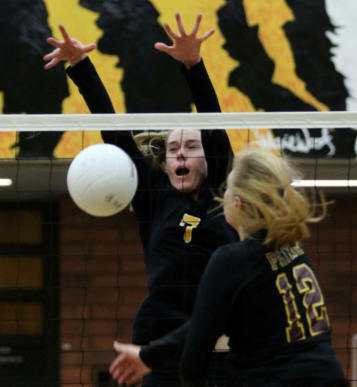 2 Phoenix Xavier Prep, who easily swept Corona del Sol in its quarterfinal match on Thursday. For the Tigers (32-10), the quarterfinal was more than a tightly played match, according to coach Joe Hesse. Maybe Gilbert could parlay its quarterfinal struggles against Xavier. The Tigers have plenty to draw from. Gilbert led 23-20 in the first set and 22-17 in the second before losing. Perry rallied by running off four straight points to get the lead and hold on in the first game. In the second, the Pumas overcame six service errors to rally. 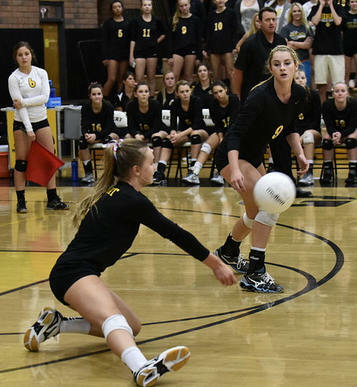 Gilbert re-established its offense with Kaitlyn Lines and Krystal Blair at the net and Makenna Martin in a supporting role. Perry had found a way to keep Lines in check with a timely block strategy. 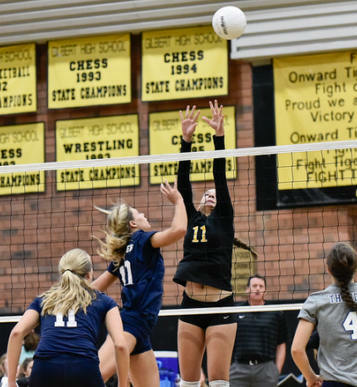 The Tigers’ leading hitter admitted it shook her confidence but she and her teammates turned it around in the third and fourth set, although Perry kept it close. Unforced errors ultimately doomed the Pumas. In the deciding set, Gilbert took control early and after scoring the first four points, never led by less than three points. Alexa Rockas had a couple of key kills late to help secure the win. 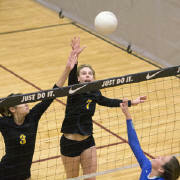 Perry sophomore middle Kennedy Kaminsky held her own against Lines, with help from Hannah Stevenson. Taylor Knoll and Ryann Davis had plenty of success to pace the Perry offense but the service errors and defensive miscues were too much to overcome. Gilbert has reached the final eight for the last 14 years in a row. Perry, in just its ninth year of existence, has reached the postseason the last three years. Gilbert stopped in semifinals - Gilbert got as close to reaching the state championship match as you can get – and not get there. Hesse was referring to Xavier’s Khalia Lanier, the consensus player of the year in Arizona, who figured prominently all night, including during the most critical stages. After not being able to bounce back in the first set, Gilbert found its offense and took advantage of Xavier’s unforced errors to win the next two and put itself in position for a return to the final for the first time since winning it all in 2011. The Tigers have lost in the quarterfinals for the last three years until rallying from an 0-2 deficit against sixth-seeded Perry on Thursday. In the pivotal fourth set, Xavier’s Lanier put away the ball down the line to get Xavier the ball back trailing 24-23. A Gilbert serve receive error left the game tied and then Lanier got a block and a kill to send the match to a deciding set. The see-saw fifth set saw neither team take more than a one-point advantage until Gilbert ran off three straight points on a Kaitlyn Lines kill, a block by Alexa Rockas on Lanier and an ace by Makenna Martin to give the Tigers a 10-8 lead. Lines hit the ball long and the Xavier rally was on. The game was tied at 12 when Lanier took over. She got kills on the last three points to secure the win. “I’m glad we went down fighting rather than not giving it our all, so that is what I am happy about,” Hill said. 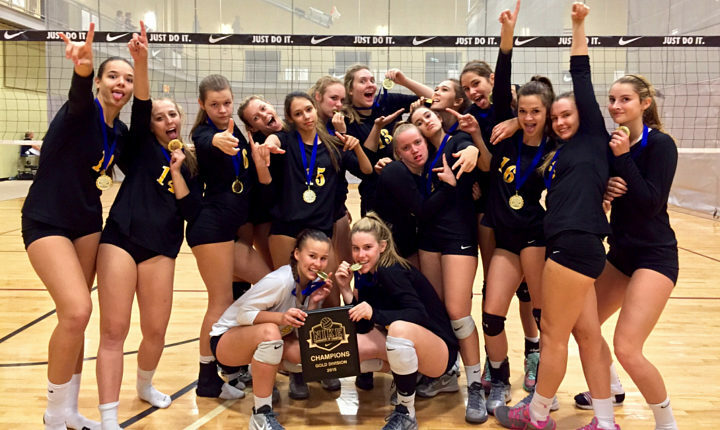 Gilbert High's girls volleyball team started play Saturday with a loss, but three victories later found itself a bracket champion at the 7th Annual Nike Tournament of Champions Invitational in Phoenix. 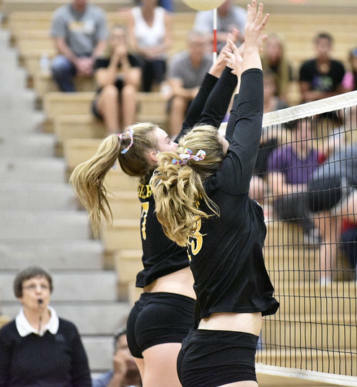 Gilbert shook off bracket-qualifying loss early Saturday afternoon and proceeded to battle injury-plagued Xavier Prep in the gold bracket it was placed in after losing to nationally-ranked Jesuit High (Portland, Ore.). 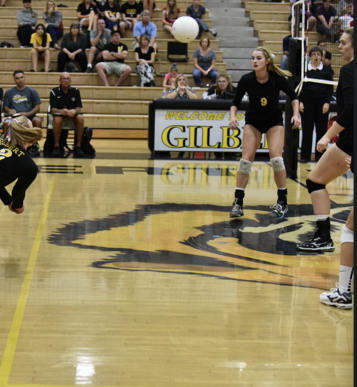 Gilbert defeated Xavier, 25-17, 21-25, 15-12 -- a Gators team trying to come to grips with losing setter Callie Jones two weeks ago to a dislocated finger and USC commit and one of the nation's top prep players in outside hitter Khalia Lanier. Lanier suffered an ankle injury three days ago in a match against Hamilton and hasn't played since. Xavier coach Lamar-Renee Bryant expects Lanier to be sidelined a couple weeks. Gilbert didn't rely on one attacker in staving off Xavier -- the Tigers usually don't. Kaitlyn Lines, Makenna Martin, Krystal Blair and Alexa Rockas combined for 30 kills in the match. 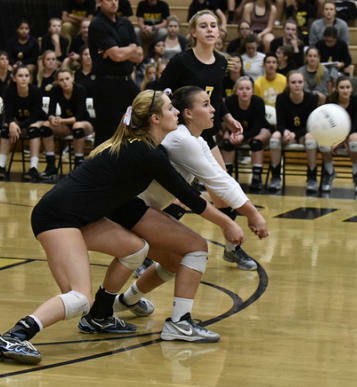 Xavier was led by Lanie Wagner with seven kills and Makena Patterson with six. Wagner willed Xavier to the win in the second set with a block and four kills among Xavier's final seven points of the set. Wagner also served the final four points of the set. There certainly was no shame in the match Gilbert lost on Saturday, nor was there in Xavier's defeat that landed it in the gold bracket. Jesuit has won its last 56 matches in a row counting the seven it won at the TOC this weekend. Jesuit went on to win the elite bracket (platinum) beating P.K. Yonge (Gainesville, Fla.) in two sets. Jesuit qualified for Platinum play by beating Gilbert, 2-1. The set Jesuit lost to Gilbert was the only set it's lost this season and only the third set it's dropped the last two years. Xavier, which dropped three of seven matches in the tournament, lost its platinum qualifier to P.K. Yonge -- another nationally ranked program along with the Gators. Before PK Yonge lost in the platinum final, it hadn't lost a set this season except to Xavier earlier in the day. Arizona teams that qualified for the platinum bracket were Desert Vista, Hamilton and Corona del Sol. 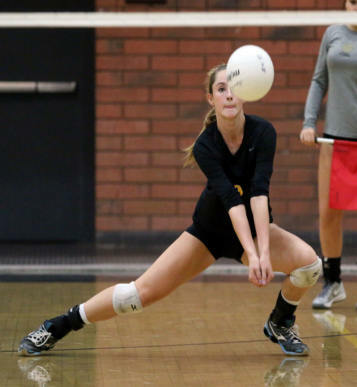 Desert Vista lost in the semifinals to Jesuit and Hamilton bowed to P.K. Yonge in the first round. Desert Vista defeated Corona in the first round of bracket play. Arizona teams managed to win titles in four of the other six brackets. 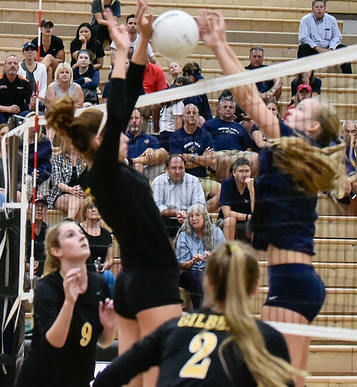 Ironwood Ridge won the Sapphire (2-0 over Mountain Ridge), Sandra Day O'Connor topped Mesa High 2-0 in the Diamond, Horizon bested Valencia 2-1 in the Silver and Desert Edge took down Tempe Prep for the Emerald crown. With several nationally ranked schools in the mix, a few Arizona teams made their mark at the Nike Tournament of Champions on Saturday. While Hamilton and Phoenix Xavier have been acknowledged as the top two teams in the state, it was Desert Vista and Gilbert who got some attention at the 64-team tournament held Friday and Saturday in Chandler, Tempe and Phoenix. As expected, the three schools ranked by MaxPreps among the top 10 best volleyball teams in the nation were in final four of the elite flight of teams by late Saturday. In a minor upset, Jesuit of Portland, Ore., beat P.K. Yonge of Gainesville, Fla. in the “Platinum” division final of the tournament, although Yonge was ranked second in the nation coming into the tournament while Jesuit was eighth. 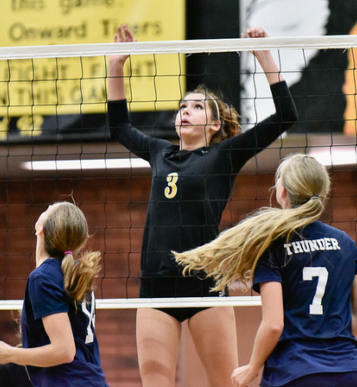 Meanwhile, defending Arizona state champion Desert Vista rallied to beat Parkland of Allentown, Penn., 21-25, 26-24, 15-11, for third place in the top tier, making the Thunder the highest placed Arizona team of the weekend. Parkland was ranked 10th by MaxPreps. 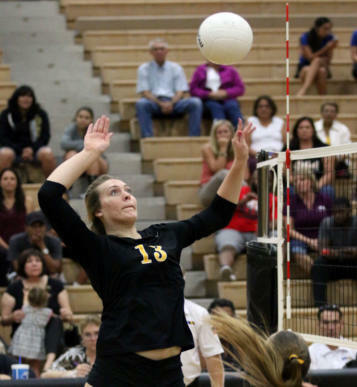 Hamilton was swept by Yonge in the quarterfinals while Corona del Sol was dropped into the consolation bracket by Desert Vista on Saturday afternoon. The Thunder were beaten 25-9, 25-22 by Jesuit in the semifinals, although the Thunder led 18-15 in the second set. In fact, Jesuit hasn’t lost a set all season until Gilbert got them in the first match of the day – the placement matches that put the Tigers in the second tied, “Gold” division. 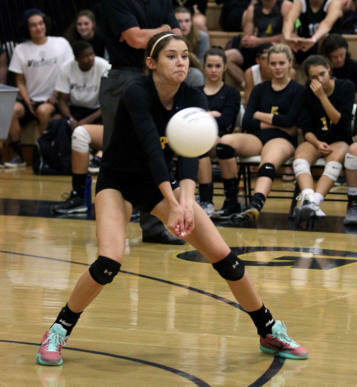 Gilbert lost 27-25, 22-25, 15-12 to the Oregon school. 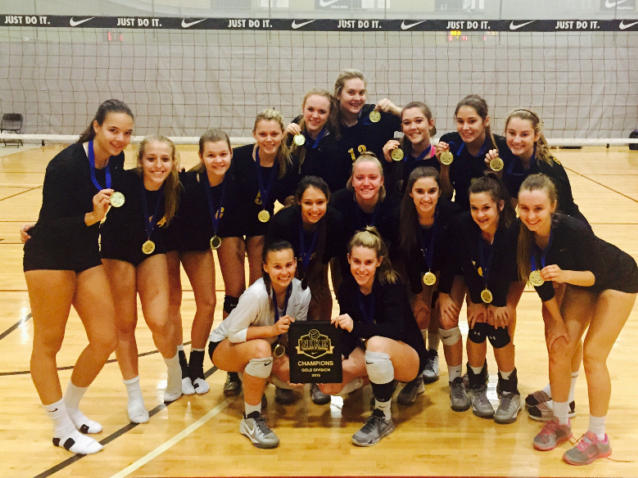 Gilbert ended up the Gold division champions, beating Xavier 25-17, 21-25, 15-12. The talented Tiger squad seemed to find its rhythm over the weekend. 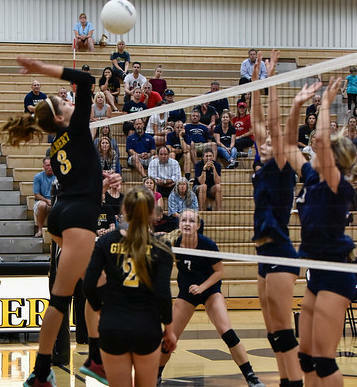 Kaitlyn Lines led Gilbert with 10 kills while Makenna Martin added six kills and 12 digs in the division final win over Xavier, who was playing with star hitter Khalia Lanier. The Xavier senior sprained her ankle in the loss earlier in the week to Hamilton. Gilbert spread the ball and had its block going against Xavier, who still had plenty of offense despite missing its best player. Sophomore Krystal Blair, who had six kills and four blocks, got a key kill late as Gilbert took advantage of Xavier unforced errors to hold off the Gators, who had tied the third set at 12. With less than a month left in the regular season, there’s enough time to make adjustments and make a run in the state tournament. The Gilbert Tigers would like to think so. After an impressive showing at the 64-team Nike Tournament of Champions last weekend, the Tigers got even more attention. Observers know about the talent level. 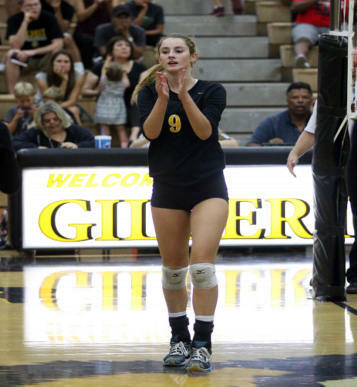 Five of Gilbert’s regulars are headed for Division I programs once they finish high school. But if you ask the players or coach Joe Hesse, there is just a bit of hesitation despite being 21-5 entering the final three weeks of the season. “We’re right there, we are very close, and we know it,” Hesse said after his team finished off top-ranked Phoenix Xavier to win the Gold division of the tournament. Co-captain Makenna Martin would agree. Even Martin was a bit tentative in talking about her team, saying it was a work in progress. Again, not that this is a group lacking in talent or confidence. The Tigers were excited about their win over Xavier — none of the players on the roster have experienced that. But you could measure a bit of disappointment that Gilbert didn’t reach the elite “Platinum” division bracket on Saturday at the Kroc Salvation Army gym in south Phoenix. The Tigers were dropped into the second “Gold” division tier after losing to eventual champion Portland (Ore.) Jesuit in the placement match. 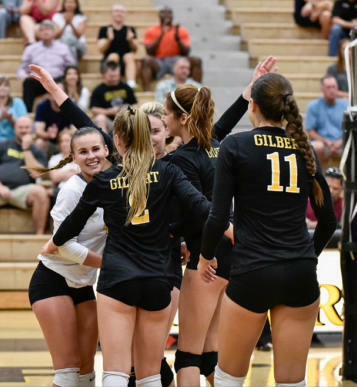 But there is even a silver lining there — Gilbert took a set from Jesuit, which hasn’t lost a set all season and is ranked in the top 10 nationally by MaxPreps. There’s a lot of talent just stepping out on the court. Seniors Hill (Loyola Marymount), Martin (Arizona) and Boever (Northern Illinois) are set to go to the next level with Lines (Utah) and junior middle Alexa Rockas (University of San Francisco) having committed early. 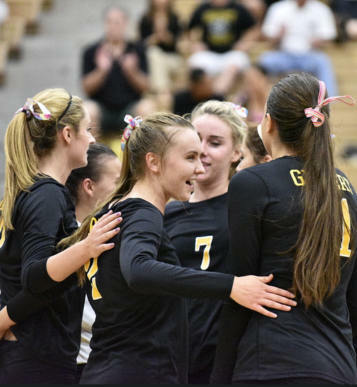 Gilbert has its own invitational tournament and matches against Mesa and Basha still left on the schedule, not to mention a meeting with title favorite Hamilton during the final week of the season. “I think we definitely have the confidence to get there; we just have to work on our skill level,” Hill added. Martin noted that the team has made strides.